After making a relatively low-key debut with ‘10ml Love’ (2010), writer-director Sharat Katariya hit gold five years later with ‘Dum Laga Ke Haisha’, a film produced by Yash Raj Films. The film, which traced the journey of a seemingly odd couple towards finding love, left a mark because of Katariya’s deft storytelling and the authenticity with which he brought to life the world the film was based in. His new film ‘Sui Dhaaga – Made in India’ also explores the lives of the characters who come from an underprivileged background. The premise of the two films is very different though. 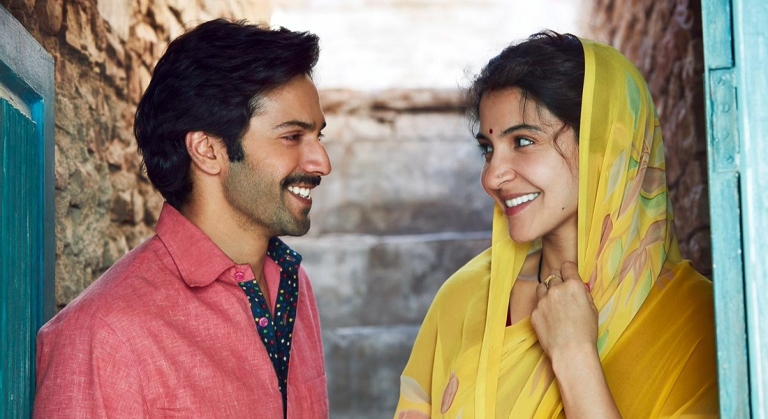 Mamta (Anushka Sharma) and Mauji (Varun Dhawan) have been married for a few years but hardly get the opportunity to spend some time or speak to each other. While Mamta is a housewife, Mauji works as a helper in a shop that sells sewing machines. Though always works with a smile on his face, the realization that Prashant (Prashant Verma), the son of the owner of the shop humiliates him in different ways hits him soon enough and he quits his job. On Mamta’s suggestion, he decides to set up a makeshift shop in a corner of a marketplace and stitch clothes – something which his family was known for at one point of time. Just like his last film, ‘Sui Dhaaga’ is set in a world the director is familiar with. Sharat has an eye for detail and that comes across very well in the writing and his execution of the written material. Each and every character – even the ones who have a scene or two – has been fleshed out very well. The subject which the film deals with is quite topical as the present Government has been reiterating on the importance of being self-reliant, making things in the country and using them. The ‘Make In India’ campaign was launched for the same purpose. The film puts across its point very nicely. The idea has novelty but the screenplay follows an arc which is largely predictable. You have seen this underdog story in several other films, more particularly in films which have explored the life of a personality. The highs and the lows, the hurdles he is going to come across – everything can be seen from a distance. Having said that, Sharat makes sure that events unfold in an organic manner and the narrative has a seamless flow. Though several filmmakers have made films set in smaller towns and villages, very few of them manage to get the cultural nuances and other details right. Sharat has managed to get it right twice. However, this time around, perhaps because of his desire to get a larger audience to watch his film, he resorts to some tropes of escapist cinema. The ease with which Mauji and Mata get a large number of people to work with and support them for the competition does not seem believable. The climax, too, is a little over-the-top but effective. The way he has portrayed the couple’s relationship is also nice. The film is powered by some fantastic performances. Anushka Sharma looks every bit of the impeccant and determined Mamta. She brings out the innocence and the resilience of the character equally well. One sees traces of the machoism Varun Dhawan brought to the fore in his action comedies but the sincerity in his performance is palpable. The film has fine actors like Raghuvir Yadav, Yamini Das, Prashant Verma and Namit Das, among others who deliver memorable performances. ‘Sui Dhaaga – Made In India’ lacks the finesse of Sharat’s last film but is a very entertaining film which manages to put across its point quite successfully.